Winona Vander Veen of Kalamazoo passed into the presence of her Savior on Friday in Kalamazoo. Mrs. Vander Veen was born April 7, 1930 in Kalamazoo the daughter of Ray and Ella (Kruzinga) Smith. 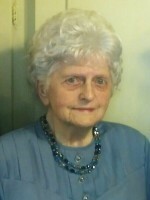 Winona was a faithful, serving member of Oak Grove Bible Church where she was the pianist. She played piano for the women at Royal Estates; she enjoyed her cats and especially loved her grandchildren. On June 25, 1948 at Twin Lakes Reformed Church she married Garrit Vander Veen who survives. Also surviving are her children, Cindy Vander Veen (Hall) Taylor of IL, Rick (Cheryl) Vander Veen of Galesburg, Victoria (Scott) Williquette of IL; 12 grandchildren and 1 great-grandson; many nieces and nephews. She was preceded in death by her parents; a daughter Lani Vander Ploeg; 3 brothers and sister. Private burial has taken place. A Memorial Service will be held Sunday, November 9 at 3 P.M. at Oak Grove Bible Church with Pastor David Ives officiating. In lieu of flowers memorials may be made to the Oak Grove Bible Church.